See? I really did mean it when I said I would come back and write more about my visit to the Smithsonian while in DC. In my last post about the trip, I wrote about some of the different planes I saw at the Smithsonian National Air and Space Museum. Clearly there is more to Air and Space than just planes though. There were also displays on rockets, landing modules and even Skylab. The Skylab display has a back-up orbital workshop that you can actually enter part of and look around. I like that an “actual” module is part of the display as it gives a nice frame of reference for size. However, my favorite display from the museum isn’t Skylab or the Army planes I posted pictures of in the last installment. Nope. What I enjoyed the most was being able to see the “Spirit of Texas” display. Here are two photos I took of this display. 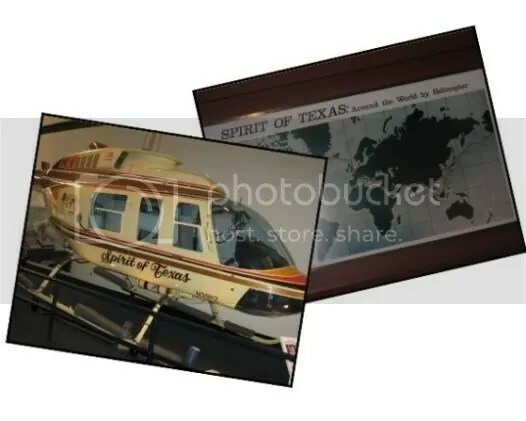 As you can see, the Spirit of Texas is a helicopter. Not just any helicopter either. This Bell 206L-1 LongRangerII was the first helicopter to circumnavigate the globe. In 1982 , H. Ross Perot, Jr and Jay Coburn took just over 29 days to circle the world in this very helicopter. One model of this type of helicopter is used by the military (granted, there are some differences from the commercially available models). The SeaRanger is used for training by the Navy. I’m not obsessed with helicopters or anything like that. I just really liked this one because of the name- the Spirit of Texas.